Thermoherb mask is based on an ancient thermal mask, which has been improved by modern techniques and perfected by the substitution of herbal extracts. A complete treatment in itself, it deep cleanses pores, restores skin balances, nourishes the skin and tightens the tissue. Improves cell respiration and renewal. A sophisticated technique in skin rejuvenation, with remarkable results, even on sensitive skin. The thermoherb mask also contains extracts of Rose, Basil,and Mint. The heat generated by the mask increases the blood circulation. As the mask cools down, it hardens, tightening the pores and tissues, sculpting the jaw line, improving muscle tone and elasticity and minimizing wrinkles. It is a rejuvenating treatment, like an instant mini face-lift. It is a total salon treatment. Clean face with Jovees Citrus Cleansing Milk. Then massage face with WheatGerm Face Massage Cream. After massaging for 12 minutes then apply a quarter inch thick layer of Jovees Wheat Germ Face Massage Cream. Place gauge covering on face with eyes cut out and room for nose to breathe. 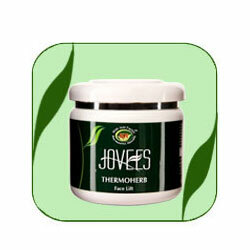 Apply Jovees Thermoherb (make a thick paste and quickly apply before it starts to harden) mask. As the mask warms up, the pores will open and the cream will penetrate the skin. It also has a deep cleansing effect. It induces relaxation and soothes the nerves and the skin. Leave on for 30 minutes. Remove Mask very gently and slowly. Wipe off excess cream. Wash face with plain water. Apply a light moisturiser, preferably Jovees White Water Lily Moisturiser. Multani Mitti, Aswagandha, Liquorice, Henna.